The Asian needle ant, Pachycondyla chinensis (Emery) (Hymenoptera: Formicidae: Ponerinae) is an introduced species thought to be native to Japan and China. This species was first reported in the United States [as Euponera solitaria (F. Smith)] from Decatur, Georgia; Wilmington, Newbern, Washington, and Elizabeth City, North Carolina; and Norfolk, Petersburg, and Richmond, Virginia (Smith 1934). Other isolated unpublished records are known from the mid 1900s from Alabama, Florida, and Tennessee (Guenard 2009). The single unpublished Alabama record is based on a queen collected in Decatur in 1939 (Guenard 2009, personal communication). However, since that time period this species has largely gone unreported until the early 21st century when large populations were found in North Carolina and South Carolina and researchers began receiving reports of this species stinging individuals. Of the approximately 200 Pachycondyla species known worldwide (Bolton 1995), only four, which are all introduced, have been reported from the United States. Pachycondyla chinensis (Fig. 1)can be recognized by the following combination of characteristics: length approximately 4.5–5.0 mm (queens larger, 5.0–6.0 mm), dark brownish-black color with orangish-brown appendages, shiny mesopleural region, single waist segment, large conspicuous eyes, and conspicuous stinger. The other three species of Pachycondyla found in the U.S. differ by being larger or by having small eyes and fine punctation on the mesopleura. This species typically nests in soil in slightly damp areas, below stones, in rotting logs and stumps, or other debris. In urban settings it might also be found under mulch, railroad ties, bricks, or other similar areas (Zungoli et al. 2008). Colony size ranges from less than 100 individuals to several thousand, and multiple queens might be present. Unlike many introduced, invasive ant species, which typically nest in disturbed areas, P. chinensis nests in both disturbed sites and natural wooded habitats where it may displace native species. Although this species appears to prefer termites as a primary food source (Nelder et al. 2006), it has also been reported to feed on various dead insects, fish scraps, and juices of rotting fruit on the ground (Smith 1934). Reactions to stings by this species range from mild to severe, sometimes with long lasting symptoms (Nelder et al. 2006). Consequently, P. chinensis poses a possible emerging health threat throughout its current range, as well as in areas where it might eventually spread. However, it is not overly aggressive, and stings typically result from handling workers or by winged queens landing on individuals and becoming trapped between clothing layers and skin. A colony of Pachycondyla chinensis was discovered on 18 March 2009 at Oak Mountain State Park in Jefferson County, Alabama (31°21'03"N 86°42'50"W), which is located in the central portion of the state. The colony was in a moist, rotting pine log on the ground in a hilly, natural wooded area bordering a lake. Numerous workers and several dealate queens were observed, with the colony extending most of the length of the log, which was at least 3 m long. Although several workers were picked up by using fingers, the ants were not aggressive and no stings were received. Colonies of subterranean termites, Reticulitermes sp. (Rhinotermitidae), were also present in the log. This represents the first confirmed report of this species nesting in Alabama and extends its known range in the United States. Figure 1. Profile of Pachycondyla chinensis worker. This article is approved for publication as Journal Article No. J-11607 of the Mississippi Agricultural and Forestry Experiment Station. Research was supported by State Project MIS-311080 and the USDA-ARS Areawide Management of Imported Fire Ant Project (Richard L. Brown, Principal Investigator). Bolton, B. 1995. A new general catalogue of the ants of the world. Harvard University Press, Cambridge, Massachusetts, USA. Guenard, B. 2009. Pachycondyla chinensis, the Asian Needle Ant. Online posting (http://www4.ncsu.edu/~bsguenar/Pachycondyla%20chinensis%20page.html), accessed 26 March, 2009. Guenard, B. 2009. Personal communication. May 25, 2009. B. Guenard, Department of Biology, North Carolina State University, Campus Box 7617, Raleigh, NC, 27695. phone (919) 515-4590; zeroben@gmail.com. Nelder, M. P., E. S. Paysen, P. A. Zungoli, and E. P. Benson. 2006. Emergence of the introduced ant Pachycondyla chinensis (Formicidae: Ponerinae) as a public health threat in the southeastern United States. J. Med. Entomol. 43: 1094-1098. Smith, M. R. 1934. 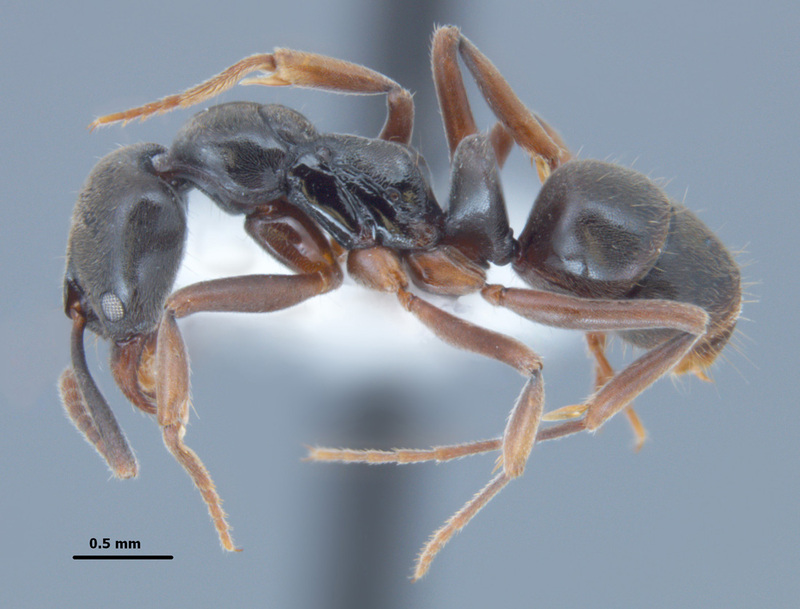 Ponerine ants of the genus Euponera in the United States. Ann. Entomol. Soc. Am. 27: 558-564. Zungoli, P., E. Benson, and E. S. Paysen. 2008. Clemson University Entomology Insect Information Series: Asian Needle Ant, Pachycondyla chinensis (Emery). Clemson University Cooperative Extension Service. 2 pp.